The first Mass at St. Mary’s Parish was performed in a Sherman hotel room in the spring of 1872. Three years later, a small chapel was built at the corner of Travis Street and Eagle Lane. This structure was soon followed by a frame church dedicated to St. Mary. In 1905 construction began on a church designed by the renowned Texas architect, Nicholas Clayton. It was completed in 1906 and would serve the parish for the next 103 years. As a result of the increased population in the area, a new church was built in honor of St. Anne in 2009. It is situated across the street from St. Mary’s Church so that mother (Anne) and daughter (Mary) may gaze upon each other with love and tenderness. Both places of prayer continue to offer refuge, hope, and solace to the many people who come to find God within their walls. Alongside St. Mary’s Church has stood St. Mary’s Catholic School, founded in 1877 and given the name St. Joseph’s Academy by the Sisters of St. Mary of Namur. These Sisters came to Sherman to provide a Catholic education for the children in our town. 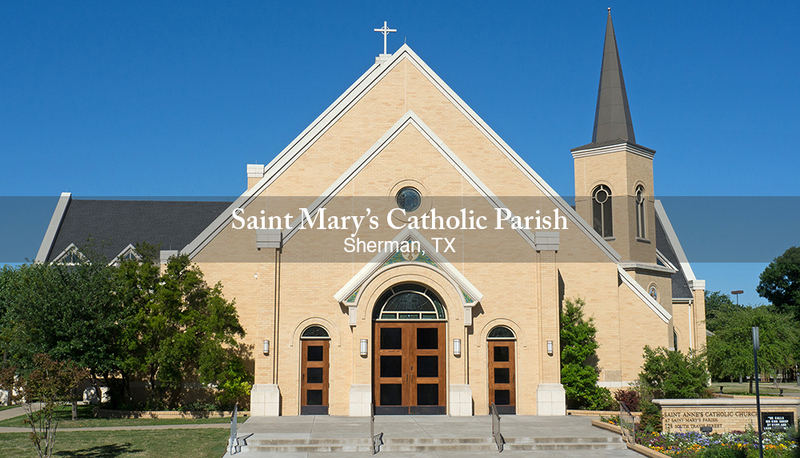 St. Mary’s School is the oldest Catholic elementary school in the Diocese of Dallas and has continued to provide excellent academic and moral training since opening. The men and women who teach in our school today follow in the footsteps of the sisters of St. Mary of Namur, demonstrating the same commitment and call to excellence. We have come a long ways from that hotel room in 1872, a distance measured not only in years but also in time, talent, and treasure given to our parish by the many parishioners who have expressed their faith alongside one another. We continue to show growth in our parish and in our school membership. We have more than 2,000 people attending our Sunday Masses each weekend. We have close to 170 students in St. Mary’s School. Our religious formation program on Sunday mornings offers instructions in the ways of our faith to more than 500 children. By the grace of God and blessed with a people committed to serving God in this world, we find here a robust community of faith, dedicated to listening to the Word of God and living it in daily life. We have many organizations, study groups, and charitable programs that bespeak the robustness of a people filled with the Spirit of God.